(editorial Intro by S. Doctrow)Â As many of you know, unlike Arlington, Lexington enjoys a modern leash bylaw, whereby dogs are allowed off leash under owner control.Â One of the favorite recreational spots for dog owners from Lexington, as well as surrounding towns including ours, is the conservation land known as Willard’s Woods. 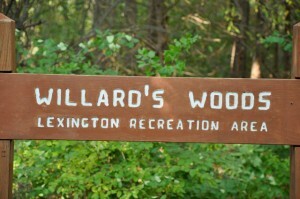 Currently, there is controversy over dog recreation at Willard’s Woods, fueled primarily by complaints from abutters, complaints not only over dog owners using Willard’s, but also over Willard’s users parking their cars on the abutters’ street.Â In response to such complaints, the Lexington Conservation Commission has held hearings and is reportedly leaning toward requiring dogs to be leashed on this property.Â I attended one public meeting, in which a member of the Commission said that their primary concern is not with the interest of residents who enjoy recreational use of this space but, instead, with protection of the land.Â Lexington dog owners, who have enjoyed a reasonable off-leash policy in their town for many years, are speaking out against this threat to take away a favorite venue for responsibly exercising and socializing their dogs. Â (This story is an allÂ too familiar one to we A-DOG members, unfortunately.Â In our town, we have faced several examples of opposition by abutters who seem to believe that they have the right to control the use of our public land, only because they live next to it). The editorial page of the Lexington Minuteman (Feb 4) reported being “inundated” with letters supporting off-leash recreation. A selection of letters was published, reprinted in its entirety below.Â If you are a responsible dog owner in Lexington, or a neighbor who enjoys taking your dog to Willard’s Woods for exercise and socialization, please speak out by writing to the Conservation Commission and to the Lexington Selectmen, your elected officials if you are a Lexington voter.Â (Also write to candidates for Selectman in the upcoming election to find out where they stand. )Â The Conservation Commission will reportedly vote on this measure February 23 at their meeting.Â The meeting is currently scheduled for the Lexington Selectmen’s meeting room in Town Hall, but might be moved to accommodate the large turnout expected.Â We will try to keep an update on the meeting on the front page of our website, but please contact us by email for the newest information on it.Â If you want to get involved in a new Lexington based dog owners group (“LexiDOG”), please write to us and we’ll put you in touch. Please note that Leslie Goldberg, a spokesperson for Lexington Dog Owners, asked me to add a reminder that we must use natural resources like Willard’s Woods as responsibly as we can, to clean up after our dogs always.Â In addition, Leslie has voiced regrets that Willard’s Woods is described as a “dog park” in some books and websites.Â She is concerned that this has brought in people unfamiliar with the controversies and sensitive issues around its use.Â In particular, she hopes that users will use extra care and remember that it is conservation land. This entry was posted in announcements, public service by Sue. Bookmark the permalink.